From prevention to restoration, Sesha Skin Therapy combines a balanced and comprehensive network of antioxidants and nutritive ingredients to slow down and reverse the signs of aging. Cell-White Brightening Mask is formulated with a plethora of skin lightening ingredients such as alpha-arbutin, a powerful whitener. Studies show that alpha-arbutin decreases melanin production by 70% compared to kojic acid. This brightening mask also combines the most advanced peptides and antioxidants to brighten skin color while cucumber extracts soothe, hydrate and tone the skin. This advanced breakthrough spot treatment actively fights comedones by regulating the production of DHT, a hormone that induces the over-activity of the sebaceous glands, and thereby controlling excess oil flow. Sesha Acne Spot Gel also localizes the bacterial blemish and prevents the further spread of bacteria. PLUS Cream is a highly advanced system that contains Vitamins A, C, and E, green tea extract, grape seed extract, and ginkgo biloba to smooth fine lines and provide protection against free radicals. Continued use is proven to strengthen and promote younger-looking skin. - Seaweed extract and caffeine reduce puffiness for a more energized and refreshed look. Active Hydra Lotion, 1.7 oz. Usage: Apply PM on dry areas; for extremely dry skin, layer over moisturizer. Formulated with a combination of Hyaluronic Acid and nano sized Oligo Sodium Hyaluronate, this lightweight and effective serum achieves maximum delivery and hydration, while boosting moisture retention and firmness. 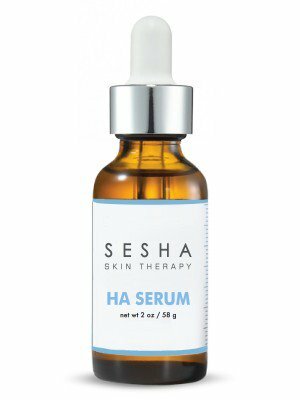 HA Serum is intended to be used during micro-needling to help tips glide on the skin during treatments. This deep-pore, non-abrasive scrub gently exfoliates dead skin cells and impurities with micro-spherical beads in a cleanser formulated with skin smoothing botanical extracts and vitamins. As the cleanser is massaged into skin, beads dissolve and release conditioners to further soften skin, leaving you with a refined, luminous glow.